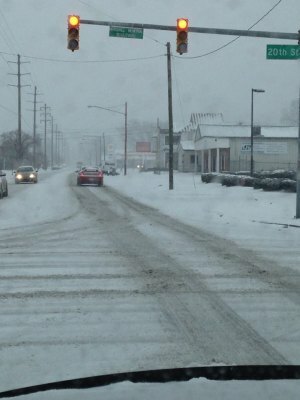 The City of Huntington has placed an order for additional salt supplies, according to communications director Bryan Chambers. In addition, Chambers revealed that despite the colder and snowier weather, the City remains well within its snow removal budget. THIS WEEK’S STORM: The city has five salt spreaders, four of which were on the roads for 36 consecutive hours earlier this week. Those salt spreaders dropped approximately 200 tons of salt onto the roadways. Jim Insco, assistant director of public works, said that approximately 90 percent of the roads in Huntington were treated at least once. SNOW REMOVAL PROTOCOL: Priority is given to hilly areas, bridges and roadways around schools and hospitals. When the temperature falls below 20 degrees, Public Works will typically add calcium to the salt. That helps activate the salt to be more effective in low temperatures. They also use cinders, which is grit that helps vehicles gain traction, to combat icy roads. STATE-MAINTAINED ROADS: There are several main thoroughfares in the City of Huntington that are state routes and, therefore, are treated by the West Virginia Division of Highways. Those include 3rd and 5th avenues (Route 60), Hal Greer Boulevard, 8th Avenue, 8th Street between 3rd and 8th avenues, Veterans Memorial Boulevard and 5th Street Hill. SALT: The city has an annual, per-ton contract for salt. This year’s rate is $55.85 per ton. The salt budget for this fiscal year is $70,000. As of Thursday, Public Works was well within its salt budget. It just ordered 400 more tons.